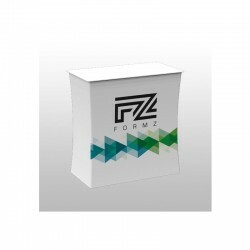 Portable trade show counters and podiums for brochures, giveaways or product display needs. 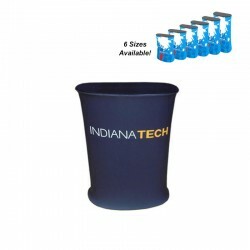 Available with custom full color printing in a variety of shapes and sizes. 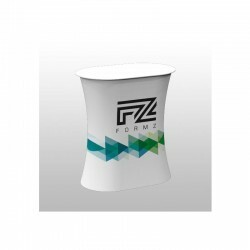 Perfect for use as a product display counter, table to handout samples or just to draw attendees into your booth space. 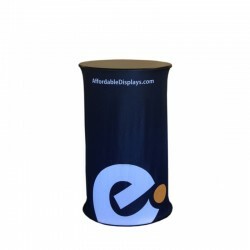 A great way to greet attendees and welcome them into to your trade show booth space is with the addition of a portable trade show counter, exhibit podium or trade show informational kiosk. 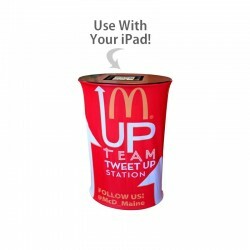 All models are easy to set-up and tear down, portable and include custom full color graphics. 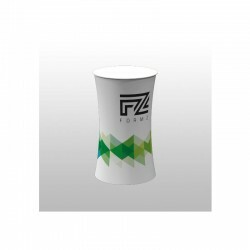 The durability of the polyester tension fabric graphics is unmatched and high resolution dye sublimation imprinting is certain to make your company stand out. 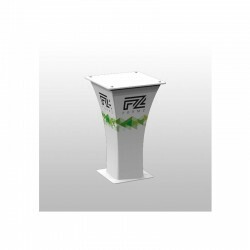 Our highly featured models are the Waveline graphic counter and Wavetube oval graphic podium. 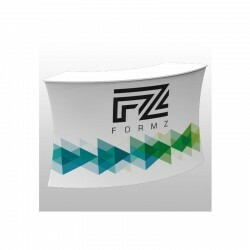 Both feature a lightweight aluminum tube framing and fully customizable stretch fabric graphic to showcase your logo or any graphic you submit for printing. The Waveline model is available in six different heights ranging from 34" tall to 59" tall, with the 39" tall model being the most popular. Similar to the Waveline model is the iPad graphic counter allowing you to place your tablet into the counter top which can be accessed by attendees to view your website or product demonstration. There is also the compact Brandcusi graphic counter which stands at a height of 39" tall and is 24" wide, so it is slightly smaller in size to the other graphic podiums available but still just as durable. 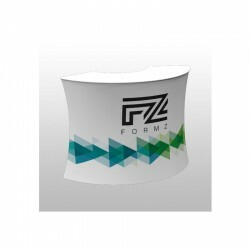 Of the tension fabric counters we have on our website, we showcase the Formz Podiums and Counters which have internal aluminum frame construction and is then covered by your imprinted tension fabric pillowcase style graphic. There are several shapes available from a circle, to rectangular, to square and even round. You're sure to find a shape to fit nicely within your exhibition booth space. 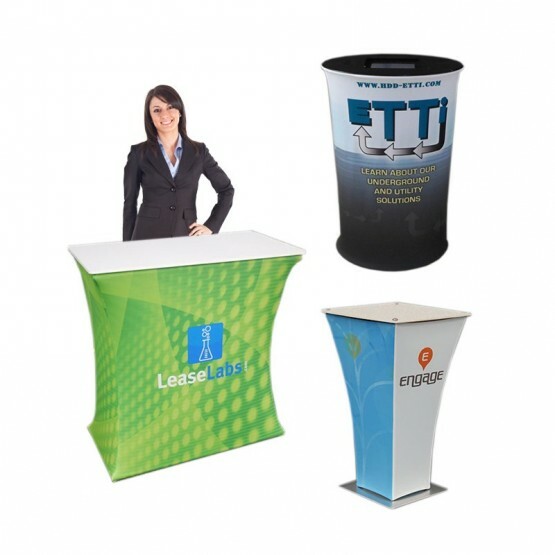 It's quite easy to improve the flow of your exhibition booth with any of of our portable counters or podiums. What's most important is that there are no tools required for assembly or disassembly on any of the models carried here at AffordableDisplays.com plus all trade show models are compact enough for car transport. 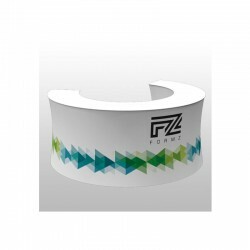 Most options are easy to set up, portable, budget friendly and a great addition to any trade show exhibition booth. Take advantage of our in-house graphic designers to bring your artwork to the next level or submit your own ready to print artwork file. 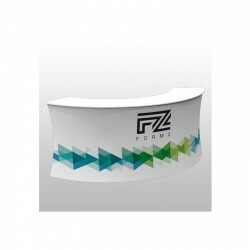 Shop now and order your counter or podium today! In addition, we also custom built trade show displays with custom sized back walls, towers, hanging elements, and side walls. Inquire about a custom quote today or call 1-800-723-2050, email [email protected] or browse online 24/7 today!